We look forward to welcoming you to the Sheraton Tribeca New York Hotel, boasting a sleek design and convenient, modern amenities. Our full-service hotel sits amid the cosmopolitan neighborhood of Tribeca, just a short walk from trendy SoHo, Little Italy, and Chinatown. For the business traveler, we are conveniently close to lower Manhattan sites such as Wall Street, and Times Square and Midtown are a short subway or taxi ride away.Settle in for a relaxing night in one of our 369 deluxe guest rooms and suites, featuring all the comforts of a master bedroom and modern bath, with soothing earth tones and vibrant pops of color. All rooms include the plush mattress, warm blanket, cozy duvet, and crisp sheets of our Sheraton Signature Sleep Experience. A generous work area with High Speed Internet Access helps maximize your productivity and comfort. Stay in a Sheraton Club Room to enjoy upgraded amenities and experience our Sheraton Club Lounge and rooftop deck overlooking the city. Suites and rooms with views of the Empire State Building and the Hudson River are also available.Our 1,000-square-foot state-of-the-art Sheraton Fitness is open 24 hours a day and features a wide range of cardio equipment. Feel free to surf the web on our computer workstations in our modern, energetic lobby, or bring your laptop for complimentary wireless High Speed Internet Access.Have a meal at Antica Ristorante, our sophisticated full-service restaurant, or stop by the Dutch Lounge for a cocktail in a chic setting. If youre on the go, grab a quick Starbucks coffee at the Link Caf .And with our fully-equipped business center and more than 1,000 square feet of flexible meeting space, our hotel is the perfect venue for your next business gathering. Plus, we have all the amenities and upgrades our loyal Starwood Preferred Guests expect including two executive boardrooms for corporate meetings of up to 16 people. 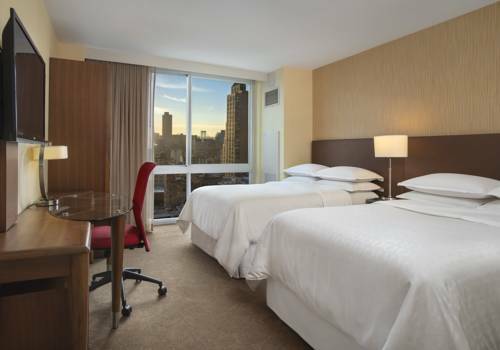 The Sheraton Tribeca New York Hotel is in the heart of New York Citys trendiest area. Shop in the hip SOHO neighborhood located across the street, barter with the street vendors on Canal Street or take a short subway ride to scenic South Street Seaport. There is no shortage of eateries, as we are a short walk to Little Italy and China Town, and offer an eclectic selection of options right at our doorstep. After making its name in the Financial District, Antica Ristorante continues to serve delicious Northern Italian cuisine, including fresh pastas and homemade desserts. Located on the lobby level, the Dutch Lounge offers the perfect place to connect with friends or colleagues over a glass of wine or a cocktail.